If the Planetary Health Diet is adopted on menus, what should the logo be? GF means Gluten Free. V stands for Vegetarian; K means kosher. Icons are a special part of communication. NIKE’s “Swoosh” became popular worldwide because it’s an image rather than a word. The Tennessee Valley Authority promoted use of electricity with the logo of a fist grabbing a lightening bolt, perhaps reference to the myth of Prometheus. The Planetary Health Diet needs a planet-related symbol, small enough to display next to a menu item. Many dietary icons like K and GF are surrounded by a circle, easy for the eye to spot on a busy menu. What if the Planetary Heath Diet icon were a circle we all know? Would you recognize the Blue Marble as a menu icon? Should the World Economic Forum endorse the Planetary Health Diet? Image: WEF logo, wikimedia. A diet that could feed 10 billion, ease the suffering of 11 million who go hungry, improve the health of 2 billion whose diet choices cause diabetes and cardiovascular ills, save health care costs, improve productivity, halt climate change, help achieve the Paris Agreement COP21, and advance the United Nations Sustainable Development Goals (SDG), might be of interest to the World Economic Forum, meeting in Davos. The World Economc Forum could agree upon a global menu logo for the Planetary Health Diet. Menu of the future dish: celery, olives, and walnuts on a nest of zucchini noodles with fresh tomato sauce and spinach garnish. Source: Shahmai.org. wikimedia. World population is growing: soon, we will need to feed 10 billion people. Globally, 820 million go hungry every day; 150 million children suffer from long-term hunger and nutritional deprivation. Conversely, 2 billion adults are overweight or obese; diet-related diabetes, heart diseases and and cancer are leading causes of death. How to balance the world’s food supply? Current levels and some choices of consumption (such as items popular in fast-food menus or backyard barbecues) are not sustainable. For example, the common hamburger: beef cattle use more grazing land, consume more water, and emit more methane, an environmentally damaging gas, than any other meat. You don’t have to be a vegan to follow the PLANETARY HEALTH DIET. Red meat: one burger, per week. Chicken and fish: twice a week. Dairy: one glass of milk, per day. Nuts: 50g per day. Chickpeas, lentils, beans: 85g per day. Fruits and veggies: 250g per day. According to nutritional and environmental scientists, this diet will improve everyone’s health and save the planet: 11 million people die each year from dietary causes. Meat and dairy use too much land: livestock emit 15% of greenhouse gases. Agriculture and food production consume 70% of global freshwater sources for irrigation. Find out more about the future of sustainable food: EAT-Lancet Commission’s Planetary Health Diet . How can cities support sustainable food? Should educational and medical dining facilities in schools and hospitals be among the first adopters of the menu of the future? Gallagher, James. “A bit of meat, a lot of veg – the flexitarian diet to feed 10bn,” BBC News. 17 January 2019. https://www.bbc.com/news/health-46865204. Willett, Walter et al. “Food in the Anthropocene: the EAT-Lancet Commission on healthy diets from sustainable food system.” 16 January 2019. The Lancet. DOI:https://doi.org/10.1016/S0140-6736(18)31788-4. https://www.thelancet.com/journals/lancet/article/PIIS0140. 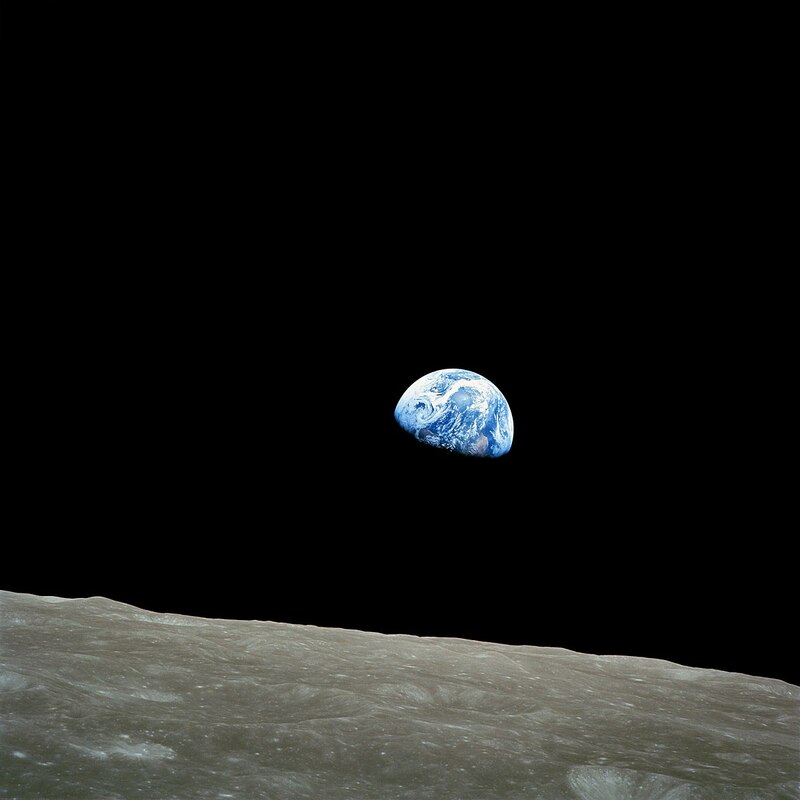 Earthrise, December 24, 1968: “You don’t see . Image: wikimedia. Fifty years ago, someone grabbed a camera and changed history. NASA Apollo 8’s crew was to orbit precisely 10 times while photographing the surface of the moon, as a field study for the Lunar Landing mission. It was 1968: before digital photography, a crew could carry only so much film – all of it was to be used for lunar surface documentation. For hours, only the occasional click was heard as the spacecraft hovered above the lunar surface, snapping photos of the topography of the moon. There was not much to look at: gray gravely surface cloaked by a dark sky. Then, suddenly, as Apollo 8 completed the first circle of the moon, an orb of blue and green surrounded by swirling clouds appeared in the module window. It was Earth. T.S. Eliot, “Little Gidding,” Four Quartets. When Frank Borman, James Lovell, and William Anders looked out the spaceship module’s window, three voices whispered astonishment in unison. Anders grabbed the camera. “Hey, that’s not our authorized mission; we’ve only carried designated film,” said the commander. The three stared at each other in a wild surmise. Then, all three nodded in assent. Anders, mission’s official photographer, captured the first view that humanity ever saw of our own Earth. To call it a selfie would be to trivialize it. Earthrise, as the photo came to be called, snapped history into a new era. “It was credited with awakening the modern version of the environmental movement,” according to former American Vice President and environmental leader Al Gore; author of An Inconvenient Truth. “You don’t see cities, you don’t see boundaries, you don’t see countries,” stated mission commander Frank Borman. The first Earth Day followed. World water laws developed further; in the United States, the Colorado River Compact updated environmental provisions; new policies like the Clean Water Act and Clean Air Act set new standards. Watch the video. Apollo 8 took the Earthrise photo on December 24, a half century ago. So, today is a kind of Golden Anniversary. Is it time to renew our vows? Wright, Ernie. “Earthrise” – visualizations created for the 45th anniversary, released on 20 December, 2013. Includes extensive downloadable videos showing the actual cloud pattern on Earth at the moment. There is link to Wright’s presentation at SIGGRAPH Vancouver. NASA, Scientific Visualization Studio. http://www.nasa.gov/content/nasa-releases-new-earthrise-simulation-video/. Spodek arena, Katowice, Poland, site of United Nations Climate Change Conference COP24. Image: wikimedia. Are we on the turn of a new industrial revolution? As governments gathered in Katowice, Poland for COP24 to discuss how to bring the Paris Agreement COP 21 to a next stage actionable directives with the agreed goal of limiting global warming to below 2.0 centigrade (or ideally 1.5); and as, at the same time one outlier government’s delegation pitched coal, a trend emerged, investors and industries held their own summit. Some might term it Industrial Revolution 2.0. Shared knowledge: 14th century manuscript depicting members of University of Paris. Image: wikimedia commons. Medieval guilds for craft and trade set regional standards for weights and measures, as well as tithes and taxes to support social goals. Charlemagne united a region in part through development of bridges, roads, and universities. Businesses, industries, and universities have long been sources of scalable innovation. Both guilds and universities trained new generations with shared knowledge spread by exchange. Both businesses and industries developed supply chains with interlocking standards that are a kind of currency of rapid exchange. Industries may change faster than governments, in no small part due to economic incentives. The first Industrial Revolution gave us many things, some involving energy sources that causing the crisis of our times. Industrial Revolution 2.0 will turn on those same forces, but turn away. Stopping coal, for example, means moving away from a system built around energy sources of the first Industrial Revolution. Industrial Revolution 2.0 means not just moving away from coal, oil, gas, and other older fuels; more importantly, it is more a question of moving to a new system that is built for the ride. Governments can talk about that; industry can build it. Businesses gave collective voice in Paris, during COP21; Bill Gates gathered 28 investors including Richard Branson and Mark Zuckerberg, to launch the Breakthrough Energy Coalition to contribute seed money to new ideas about energy. Branson stated: We must produce an abundance of clean, renewable energy and drive further innovation to make the next generation of energy more efficient. It will benefit the environment, our society and the economy. When 415 investing organizations, with an economic force of $32 trillion, gathered in Katowice, Poland, this week to add their collective voice to COP24, they pledged a new set of standards that may, if met, prove of merit as detailed in the 2018 Global Investor Statement to Governments on Climate Change. It’s clear our innovators are taking action: what can each of us do? Jessop, Simon. “Investors managing $32 trillion in assets call for action on climate change.” 9 December 2018. Reuters. http://www.reuters.com/article/us-climatechange-investors/investors-managing-32-trillion-in-assets-call-for-action-on-climate-change-idUSKBN1080TR. Tom Brady, New England Patriots. Image: wikimedia. Landmark program of the National Football League (NFL). “My Cause, My Cleats” features football athletes sending a signal. Players declare their cause and customize their shoes to put the cause into action. For the New England Patriots, messages include Tom Brady: Best Buddies; Sony Michel: Haitian Earthquake Disaster Rebuilding; Matthew Slater: International Justice Mission. Michael Jordan may have started the trend of sending a message through athletic footwear. Image: wikimedia. Could the idea mobilize the future of climate change? This week, world leaders meet in Katowice, Poland for COP24: three years since COP21, and the Paris Agreement, it’s time to take the climate’s pulse. In light of the IPCC data showing deteriorating climate and nations are not on target, compounded by the recent report on climate and economy in the United States, one of the questions to be debated in Poland may be how to communicate the urgency. Climate scientists have commented that finding the right message and image is challenging. Polar bears didn’t work; plastic in fish led to some awareness but did not solve the problem. What could? The power of an image and a slogan. Image: Social welfare library, Virginia Commonwealth University. Some of the greatest successful macro initiatives in history came to life with a coined word, a slogan, an image. The Channel Tunnel had been in some form of planning since Napoleon, but it took a newly coined word, “Chunnel,” (by Frank Davidson) to make the idea of a rail tunnel across the channel linking England and France popular enough to get built. The Tennessee Valley Authority (TVA) “sold” the idea of electricity with a slogan “Electricity for ALL” emblazoned on one of the first logos in history: a fist clutching a lightning bolt, reminiscent of Prometheus. Poland could recommend sports stars and teams adopt one of the United Nations Sustainable Development Goals (SDG) for example. Another image? #1.5, slogan displayed on the Eiffel Tower in Paris in 2015, and the subject of the world’s largest postcard collaged on a glacier in Switzerland. “My Cause, My Cleats” might help to mobilize change. Making climate action fashionable can be even more exciting when profitable. The NFL invites fans to bid in an online auction to buy the cleats, assured that 100% of the proceeds will go the player’s charitable cause. COP24 could, among its recommendations on climate action, send a global message of peace and sustainability through the 2020 Olympics. When Tokyo hosted the games half a century ago, Japan launched a new era in efficient-energy speed-rail transport: Shinkansen. Will the Olympics of 2020 send the message of climate action in sartorial splendor? Bobin, Jean-Louis. Les Déconvenues De Prométhée: La longue marche vers l’énergie thermonucléaire. Atlantis Sciences/Atlantica 2001. ISBN: 2843943264. Center for Rebuilding Sustainable Communities After Disasters. “Haiti: After the Cameras Have Gone.” 2010. University of Massachusetts Boston. Davenport, Coral and Kendra Pierre-Louis. “U.S. Climate Report Warns of Damaged Environment and Shrinking Economy.” 23 November 2018. The New York Times. NFL . “My Cause My Cleats” NFL Auction. Sullivan, Tyler. “Patriots players reveal their My Cause, My Cleats.” 30 November 2018. 247sports.com. UNFCCC. “Katowice Climate Change Conference – December 2018.” United Nations Climate Change. https://unfccc.int/katowice. Mont Blanc, highest peak of the Alps. Will the name change with the climate? Image: wikimedia. Switzerland sent the world a postcard. A collage of 125,000 drawings by children across the world, assembled for aerial display on Switzerland’s Aletsch glacier, receding at 12 meters (13 yards) per year. Organized by the Swiss Agency for Development and Cooperation, the campaign is part publicity stunt to establish a Guinness world record, and part educational campaign to engage the next generation in climate action. While individual children’s messages on the segments include pledges and pleas (Save the Future for Us), the aerial overview spells out the message “#1.5C” reminding the world of the Paris Agreement where 195 nations pledged to reduce emissions, holding global warming to 1.5 degrees Celsius. “1 Heart 1 Tree” by Naziha Mestaoui. image on Eiffel Tower, 2015, by Yann Caradoc. Wikimedia commons. France’s Eiffel Tower turned into a banner proclaiming the message to stop climate change in 2015. Artist Naziha Mestaoui designed “1 Heart 1 Tree” for people to add, via a mobile app, a virtual tree to a green installation on the Tower while actual trees were planted in Australia, Brazil, India, Kenya, Peru, and Senegal. Mestaoui was inspired by the “trees of peace” program in Kenya, designed by Nobel Peace laureate Wangari Maathai. Many cities around the world have iconic monuments: Sydney’s Opera House, New York’s Empire State Building, Dubai’s Burj Khalifa are among the possible “billboards” that may invite us to look up into a better future. Keaton, Jamey. “Kids’ postcards blanket Alpine glacier in eco-friendly stunt.” 16 November 2018. AP News. https://www.apnews.com/97e0023d66754fcc8e6b5832d463a10b. Paris Agreement complete text: https://unfccc.int/sites/default/files/english_paris_agreemet.pdf. Peltier, Elian. “Eiffel Tower Goes Green for Climate Talks.” 29 November 2015, The New York Times. https://www.nytimes.com/interactive/projects/cp/climate/2015-paris-climate-talks/eiffel-tower-goes-green-for-climate-talks. 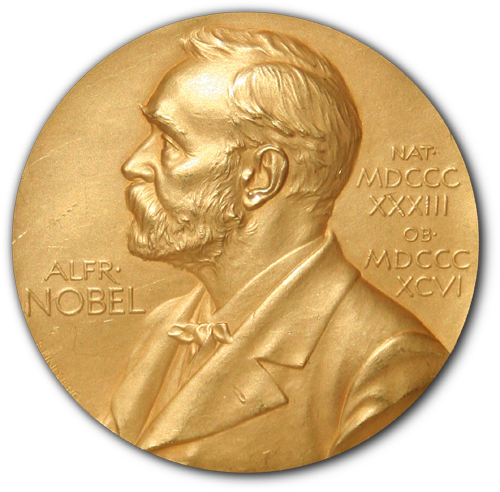 Nobel Prize in Economics 2018 goes to carbon tax advocates: William Nordhaus and Paul Romer. Image: wikimedia. The Nobel Prize in Economics, awarded to William D. Nordhaus and Paul M. Romer, followed a recent report from the Intergovernmental Panel on Climate Change, warning of urgent and dire effects if the world does not limit global warming to below 2 degrees Celsius (3.6 Fahrenheit). Nordhaus advocated carbon pricing and taxation, stating: When I talk to people about how to design a carbon price, I think the model is British Columbia. You raise electricity prizes by $100 a year, but then the government gives back a dividend that lowers internet prices by $100 a year. You’re raising the price of carbon goods but lowering the prices of non-carbon-intensive goods. Davenport, Coral. “After Nobel in Economics, William Nordhaus Talks About Who’s Getting Pollution-Tax Ideas Right: A few governments – notably parts of Canada and South Korea – have adapted the the ideas in ways that frame them as a financial windfall for taxpayers.” 13 October 2018. The New York Times. Organization for Economic Cooperation and Development (OECD). “Few countries are pricing carbon high enough to meet climate targets.” 18 September 2018. http://www.oecd.org/tax/few-countries-are-pricing-carbon-high-enough-to-meet-climate-targets.htm. Rathi, Akshat. “Why the newest Nobel laureate is optimistic about beating climate change.” 8 October 2018. Quartz Media. https://qz.com/1417222/why-new-nobel-laureate-paul-romer-is-optimistic-about-beating-climate-change/. 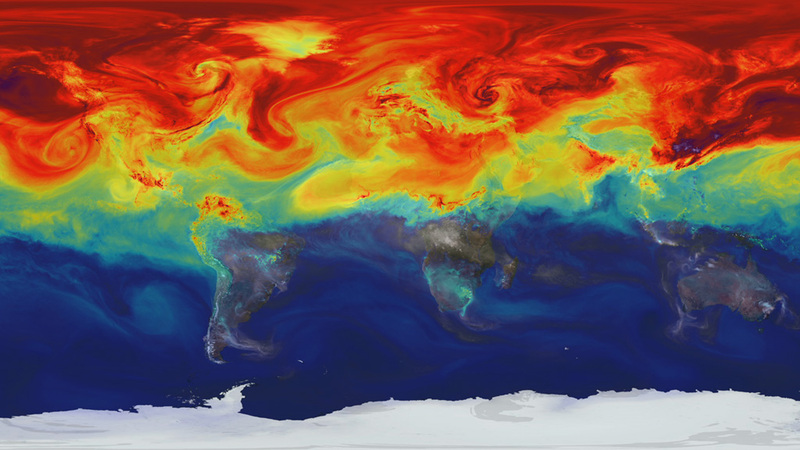 “Simulating Carbon,” by William Putnam, 18 November 2014, NASA Visualization Explorer. Image: nasa.gov. The Intergovernmental Panel on Climate Change issued a warning: if the world keeps going at present rate, we’ll miss the target agreed upon in Paris 2015 (COP21) for limiting global warming. The goal of 1.5 may be out of reach; 2.0 Celsius may be unlikely. Human activities are estimated to have caused approximately 1.0 Centigrade of global warming, above pre-industrial levels, with a likely range of 0.8 to 1.2. Global warming is likely to reach 1.5 between 2030 and 2052 if it continues to increase at the current rate. Global warming in 2015; things now are even worse, warns IPCC. Image: wikimedia commons. IPCC, “Global Warming of 1.5Centigrade: Summary for Policymakers.” http://report.ipcc/ch/sr15/pdf/sr15_spm_final.pdf. Even if you’re not in California for the Global Climate Action Summit, you might participate in affiliate events around the globe including “Food and Climate Strategy Session: Building Solidarity with Demand-side Solutions” in Brooklyn, NY on September 13. With Brighter Green, Loyola Marymount University, Mediterranean City Climate Change Consortium (MC-4), ProVeg International, Friends of the Earth, and members of the Food and Climate Alliance. Another example of urban food and climate innovations: City Farm Fish in the creative shadow of the Brooklyn Bridge. David H. Marks and Edward Spang are among those who find the Energy – Food – Water nexus may determine the future of global climate. It takes energy and water to grow the world’s food: some aliments require more allotments. Sir Paul McCartney is among the artists who raise voices and awareness in support of sustainable food. Do you know the water, energy, and environmental aspects of your favorite foods?